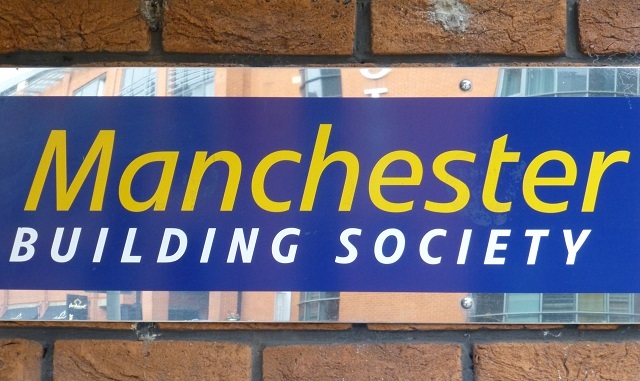 The Manchester Building Society is sinking. It has reported a post-tax loss of £4.9m and a fall in reserves of £5.4m. This is not a one-off disaster due to an external shock. No, these results are symptomatic of a deep underlying malaise. The Manchester is in terminal decline, broken not by the financial crisis, nor by regulators, but by its own accountants. The total value of mortgages at 31 December 2012 that had been subject to interest rate swaps was £167.7m. The swap and the designated mortgages were accounted for using the hedge accounting principles of IAS 39. Under the terms of IAS 39, the Society had calculated the fair value of the swaps and the fair values of the mortgages at each year end, since 2006 when it first adopted hedge accounting. As the fair values of both the swaps and the mortgages vary over time by reference to LIBOR rates, there was some volatility in these values at each year end. IAS 39 requires that, when there is an effective hedging relationship in place, the volatility in the market value of the swaps are offset in the Society’s accounts by the fair value adjustment to the mortgages – in practice, these fair values offset each other as they are in opposite directions, with limited volatility remaining in the Statement of Comprehensive Income. The Society has now identified that the swap arrangements it had entered into in respect of these assets did not meet the technical requirements for hedge accounting under IAS 39. As a result of this, the fair value movements in the swaps remain to be recognised fully through the Statement of Comprehensive Income, whilst there is no fair value ascribed to the mortgage assets and they are recorded in the Statement of Financial Position at their amortised cost. The gap was massive. As at 31 December 2011, the fair value that had been ascribed to the mortgages was £39.2m. All of this had to be stripped out. The 2010 and 2011 balance sheets were restated to reflect both the revaluation of the fixed-rate mortgages and the consequent unhedged loss on the interest rate swaps. Due to these unexpected losses, the Manchester recorded an additional Deferred Tax Asset of some £5m, anticipating 80% recovery over the next 10 years. But as we shall see, this was to come back to haunt them. In 2013 the Manchester's auditor, Grant Thornton, resigned. Grant Thornton was subsequently fined by the FCA over its failure to spot the hedge accounting error. The Manchester is now suing it for negligence, claiming damages of £49m. It was identified during the 2013 year end audit that a particular clause of the mortgage contract meets the definition of an insurance contract; where a borrower dies or goes into long term care and a subsequent redemption receipt is less than the outstanding loan balance, the Society does not have any further ability to recover amounts from the borrower or their estate. The recognition of an insurance liability based on this insurance risk results in a prior year adjustment. The impact of the restatement is: An increase in provisions of £4.2m at 2012 (2011: increase of £3.1m) and an impairment loss of £0.5m in 2012 and reduction in interest and similar income of £0.2m, reflecting an adjustment to profit before tax of £0.7m, and a reduction in income tax of £0.2m and a reduction to 2012 opening retained earnings of £3.1m. 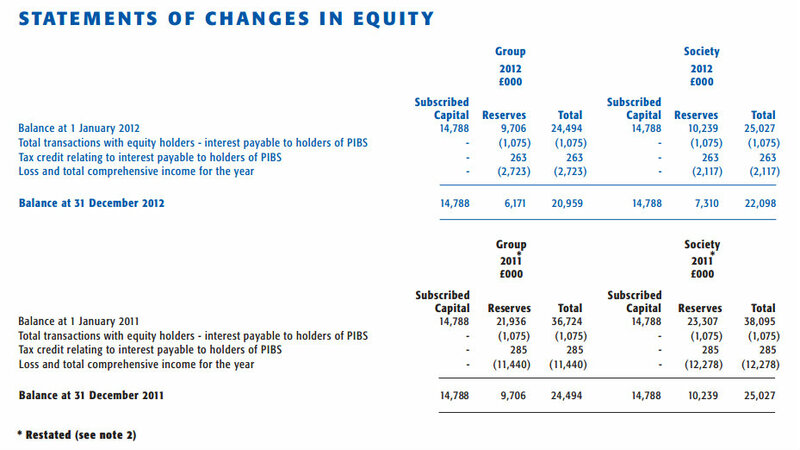 The cumulative effect of these restatements (plus adoption of a different accounting treatment for levies) reduced the Manchester's 2012 total capital by a further £7.6m, though £5m of this (the 1999 PIBS issue) was taken as a reduction in subscribed capital rather than reserves. In April 2013, the Manchester raised £18m of new CT1 capital with a PPDS issue. During 2013, the Manchester sold its Lifetime mortgage book and its Icelandic debt assets at a profit of £1.53m, and it also exited from most of its interest rate swap portfolio. But despite this, it turned in a full-year loss of £7.1m. This was partly due to new impairment provisions of £8.7m, mainly on a third party mortgage book on which it discovered it could be liable for all losses. But £5m of the loss was due to write-down of the Manchester's Deferred Tax Asset. The Board was beginning to realise that the path to recovery for the Manchester would be an extremely rocky one. The 2013 loss reduced the Manchester's capital levels so much that it was forced to stop lending. It became a zombie. Throughout 2014, it concentrated on shrinking its balance sheet and shoring up its capital. But there were no further disasters: it turned in a post-tax profit of £4.4m and its gross capital rose from 7.3% to 10.4%. The Board cheerily said that it would examine the possibility of returning to lending in 2015. The cheerfulness was short-lived. The Manchester did not return to lending in 2015: the Board's investigation revealed that its core equity was too weak to support more lending. And the 2015 loss made matters worse. The 2015 loss is perhaps the saddest part of the Manchester's story. It arises mainly from two enormous impairments that are themselves a consequence of the Manchester's decline. The first is a £2.5m impairment of the carry value of the Manchester's head office. The Manchester simply no longer needs a building of that size. But as it is the Manchester's only branch, it is stuck with it. The second is a further £4.3m writedown of the Deferred Tax Asset, making a total write-down of over £9m. That is nearly all of it. The Board has effectively admitted that the Manchester is unlikely ever to make enough profit to be able to use the tax asset to offset future tax liabilities. ....there is a shortfall of £1.6m against this CET1 expectation as at 31 December 2015. Under the new regulatory capital regime effective 1 January 2016, at that date there is a £2.8m shortfall. After the year end, on 11 April 2016, the Society received new Individual Capital Guidance (“ICG”) from the PRA setting out the amount of regulatory capital the Society is required to hold. The Board has reviewed the capital resources following the new guidance from the PRA and has concluded that the ICG and CRD IV buffer requirements are met. The Board also concluded that the Society meets the quantitative aspect of the PRA buffer. As previously, the Society is expected to hold a certain proportion of its capital buffers in CET1 capital; this remains challenging under the new guidance and the Society may not meet these expectations going forward. Realistically, the Manchester is unlikely to be able to increase its capital quality sufficiently to return to lending, But without a return to lending its long-term outlook is bleak. It desperately needs a capital injection. But from where will this come? Issuing more core equity is a non-starter, because of the Manchester's mutual status and poor outlook. The best outcome would be a buy-out or takeover, perhaps - Co-Op Bank style - by a friendly hedge fund or two. Though the market for distressed mutuals is pretty thin, these days. But if there is no possibility of rescue, then it will eventually become insolvent. Under new European banking rules, resolving it would mean imposing losses on shareholders and creditors. Those who bought the PPDS in 2013 may lose their entire investment, as may holders of the 1999 and 2005 PIBS. And in the worst scenario, large depositors may find themselves with a haircut. The Manchester has joined the ranks of the living dead. Even if the Grant Thornton damages claim is successful, it will probably come too late to save it. Maybe the regulator will kill it off. It would be a kindness.